Scientists at the Leonardo Project want to sequence da Vinci's genome. A drawing by Leonardo da Vinci on display in Venice in 2013. It would be pretty fascinating to study Leonardo da Vinci’s genome and try to find clues to the origin of his brilliance. Of course, genetics can’t tell us everything, but any clue about da Vinci, who died 497 years ago, is valuable. One problem, though. How do you sequence the genome of someone who’s been dead for centuries? A group of specialists think they can do it. “The Leonardo Project,” which will honor the 500th anniversary of da Vinci’s death, published a schedule for the genome sequencing project in the journal Human Evolution on Thursday. Anthropologists, art historians, geneticists, genealogists, microbiologists, and other researchers will collaborate on the project to uncover new physical evidence linked to da Vinci. The plan includes studying the microbiomes of da Vinci paintings and tracking the inventor’s descendants, both living and dead. The project will evaluate bones that may or may not be da Vinci’s, and will use radar in an attempt to locate da Vinci’s father’s remains, which are thought to be buried under an Italian church. 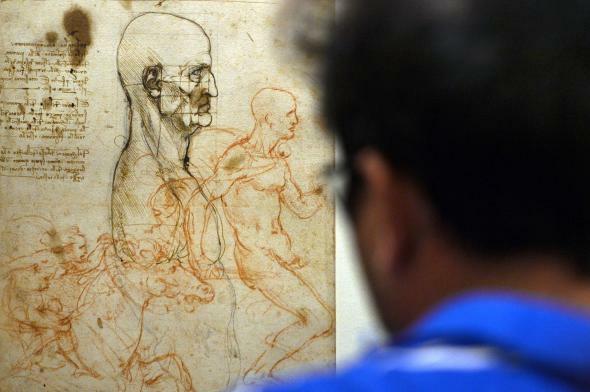 Researchers will also try to verify da Vinci’s fingerprints and search for them on his works. Information about da Vinci’s genome would lead to a better understanding of his talents, physical characteristics, and disease risks. “They hope to acquire an extensive enough genetic profile to understand better his abilities and visual acuity,” Jesse Ausubel, vice chairman of the Richard Lounsbery Foundation (a sponsor of the Leonardo Project), wrote in Human Evolution. It will be complicated, however. A first phase of the project began in November 2014 to definitively identify da Vinci’s remains and get DNA samples from the bones. Ausubel describes such a specimen as “yet to be found,” though. The methodologies the project develops should be valuable, but it remains to be seen whether it can produce a full da Vinci genome by 2019. As history-altering geniuses go, it seems like it would be easier to sequence Einstein’s genome, since he died much more recently and his brain was preserved. But the difficulty level will make the da Vinci genome a much more amazing achievement—if it happens.